A newspaper article written by Ben Wheeler and published by The Oviedo Voice in February of 2006. 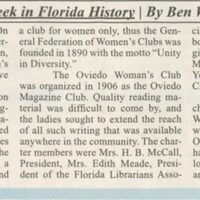 The article describes the history of the Oviedo Woman's Club (OWC) and also provides a brief history of woman's clubs in Florida. According to the article, the Green Cove Springs' Village Improvement Association was formed as the first woman's club in Florida on February 20, 1883. Original newspaper article: Wheeler, Ben. "This Week in Florida History: Woman's Club Makes History." The Oviedo Voice, Vol. XVI, No. 7, February 16-22, 2006: Private Collection of Beatrice Gestrich. Digital reproduction of original newspaper article: Wheeler, Ben. "This Week in Florida History: Woman's Club Makes History." The Oviedo Voice, Vol. XVI, No. 7, February 16-22, 2006. Originally created by Ben Wheeler and published by The Oviedo Voice. Wheeler, Ben. “This Week in Florida History: Woman's Club Makes History.” RICHES of Central Florida accessed April 19, 2019, https://richesmi.cah.ucf.edu/omeka/items/show/5804.